Martyn Hilbert's Railway Photography - Preston & District - 3-Car Class 101, M53327 at Leyland. 3-Car Class 101, M53327 at Leyland. A Metro-Cammell Class 101 3-Car DMU stands on the Up Fast at Leyland as it calls with a Blackpool North to Manchester Victoria service on November 4th 1986. DMBS M53327 is leading. 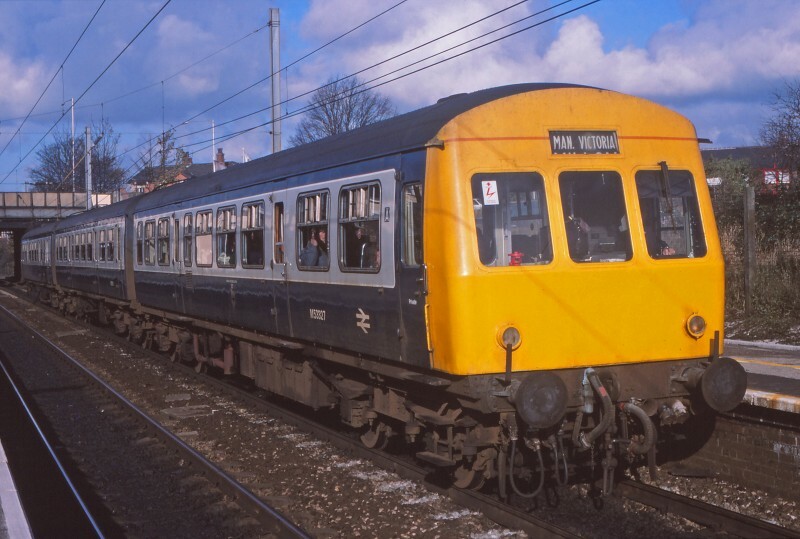 The 101s were never common around Preston, but several sets appeared at Newton Heath during the mid 1980s as a stop-gap between the worn-out Class 104s & 120s and the introduction of the new Class 150 Sprinter fleet.